UK mortgage rates: born in the USA? Authors: Gareth Anderson and Matt Roberts-Sklar. UK mortgage rates play an important role in the transmission mechanism of monetary policy, but are they home-grown? UK swap rates are a key component in determining UK mortgage rates. And UK swap rates are highly correlated with those in the US. Putting these pieces together, we show that UK mortgage rates increase by around 50bp on average in response to a 100bp increase in US swaps. This highlights one important channel through which global financial spillovers affect small open economies such as the UK. What determines the price of mortgages? In the UK, mortgage rates on new lending are influenced by a number of factors: the marginal funding cost faced by lenders, their assessment of borrowers’ credit risk and a variety of other factors including the lenders’ operating costs and the mark-up which they charge. Interest rate swaps – derivative contracts where two parties exchange fixed-rate payments for floating-rate payments based on Libor – are a key component of banks’ marginal funding costs for mortgages. If swap rates are higher, with all other factors held equal, lenders’ marginal funding costs are likely to be higher, and to some extent we would expect this to be passed-through to the pricing of new mortgages. This can be seen in Chart 1, which shows the UK 5-year swap rate (in blue) and the UK 5-year fixed 75% LTV quoted mortgage rate (in green). Over a longer period, this would have an impact on the stock of fixed rate mortgages, as contracts come up for renewal. How sensitive are UK mortgage rates to changes in UK swap rates? To quantify the importance of UK swap rates for the pricing of UK mortgage rates, we regress monthly changes in quoted UK mortgage rates on monthly changes in UK swap rates of a matching maturity (for variable rate mortgages, changes in 3-month swap rates are used). Since pass-through may not be immediate, we include lags out to two months of changes in UK swap rates. 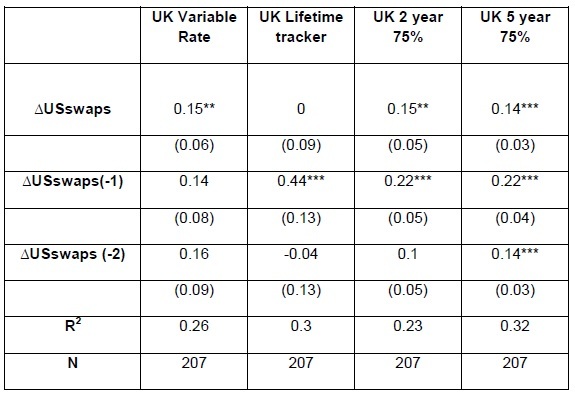 For UK 2 year and UK 5 year 75% LTV mortgages and UK variable rate mortgages, both contemporaneous and lagged changes in UK swap rates are significant in explaining changes in UK mortgage rates (Table 1). And for both UK 2 year and UK 5 year 75% LTV mortgages, a 100bp increase in the relevant swap rate is associated with an increase in mortgage rates of around 70bps after two months. But these results only reflect the average effects of changes in UK swap rates on UK mortgage rates. In practice, the impact of swap movements on mortgage rates will depend on the nature of the underlying shock and, importantly, how it affects the other components of funding costs. It is not hard to argue that international linkages and financial channels are important for the UK economy. For example, there is strong co-movement of bond yields across countries, with UK yields often being driven by overseas or global factors. This co-movement reflects not just investors expecting business cycles to be in sync, but also the influence of global financial factors (such as global risk aversion) on term premia, especially for longer maturities. But it is not just bond yields that co-move across countries. The rates on interest rate swaps also appear to co-move (Chart 1). 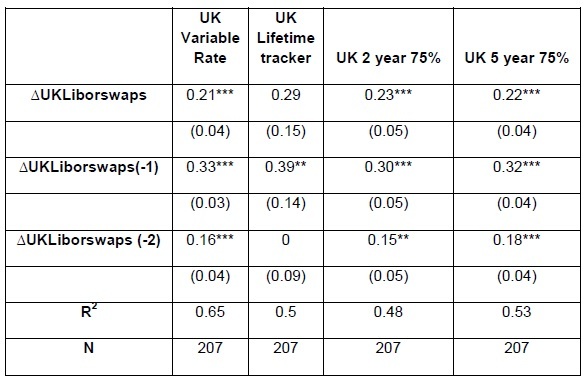 To check the scale of this co-movement, we regress weekly changes in UK swap rates on changes in US swap rates of the same maturity (Table 2). For all the swap maturities considered, changes in US swaps are strongly significant in explaining changes in UK swaps. For UK swap maturities of 2 to 5 years, changes in US swaps account for around 40% of the variation in changes in UK swaps. A 10bp move in US swaps at the 2-year horizon is associated with a change in UK swaps of around 6bps. As these swaps are based on Libor, they contain a premium for bank credit and liquidity risk as well the usual term premia present in bond yields. To isolate this, we split US swap rates into overnight index swap (OIS) rates and a spread, and regressed changes in UK swaps on changes in these components. This suggested that changes in US OIS rates and changes in the spread are both significant in explaining moves in UK swaps, though UK swaps seem more responsive to the former than the latter. What is the impact of a change in US swap rates on UK mortgage rates? Tying together the results that UK swap rates are significant in explaining UK mortgage rates and that UK and US swap rates co-move, we now look at how a change in US swap rates affects UK mortgage rates. To do this, we simply regress changes in UK mortgage rates on changes in same maturity US swap rates (Table 3). Unsurprisingly (given the results presented above! ), for each of the mortgage rates considered, either contemporaneous or lagged changes (or both) in US swaps are significant in explaining changes in UK mortgage rates. Summing the coefficients in each regression suggests that UK mortgage rates increase by around 50bp in response to a 100bp increase in US swaps. For 5 year 75% LTV mortgages, both contemporaneous changes and lagged changes are significant. And for 2 year 75% mortgages, both contemporaneous and 1 month lagged changes are significant. 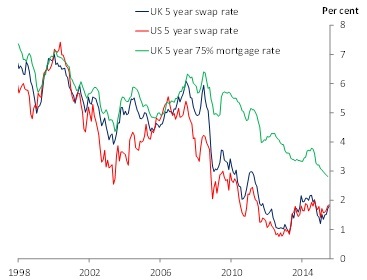 The responsiveness of UK mortgage rates to US swaps also tends to be lower than the responsiveness to UK swaps (the coefficient values are smaller). How important is this for the UK monetary transmission mechanism? For the stock of UK mortgages, around 60% are floating rate and 40% are fixed rate. The proportion of new mortgage business at fixed rates has increased in recent years from around 65% in 2012 to around 85% in 2014. The majority of new fixed rate mortgages are taken out at 2 year or 5 year durations. Data from the Product Sales Database suggests that for the flow of new fixed rate mortgages in 2014 Q4, around 55% were 2 year fixes and 30% were five year fixes. Higher mortgage rates reduce the discretionary income of those affected, meaning they have less money to spend on consumption. In the near term, a change in mortgage rates will affect new borrowers and those with variable rate mortgages. Those already on fixed rate deals are insulated from higher mortgage repayments in the near term, but they will face higher repayments when their fixed rate deal expires. The 2014 NMG household survey suggested that around 60% of mortgagors would cut spending if they were faced with a 2 percentage point rise in interest rates. To get a rough idea of the effect which a shock to mortgage rates would have on the economy, we can use a model developed by colleagues at the Bank (see Cloyne et al., forthcoming). Raising all mortgage rates by 50bp and assuming that there is no offset from a monetary policy response, could reduce the level of GDP by up to 0.3% after two years. There are of course other channels by which changes in US swap rates can affect the UK economy, including their impact on other UK household, corporate and government borrowing rates. And the non-swaps part of UK mortgage rates (which includes bank credit risk) could also be affected by global financial factors. That said, some of the recent strong co-movement in UK and US swaps is likely to reflect expected business cycle synchronicity, especially at shorter maturities. So the causal effect of a move in US swaps on UK GDP may be lower than we estimate. So are UK mortgage rates “born in the USA”? Well, the regression results above demonstrate the strong co-movement between UK and US swap rates. They also confirm the strong relationship between UK swaps and UK mortgage rates. Combining these insights, we’ve shown that shocks to US swaps can have a significant impact on UK mortgage rates. We wouldn’t want to oversell these results – they are partial in their nature and we’re agnostic on the source of the shock to US swap rates. But they do show that UK mortgage rates are not just affected by domestic factors, and in fact can be influenced by changes in rates in the US. Gareth Anderson works in the Bank’s Monetary Assessment and Strategy Division and Matt Roberts-Sklar works in the Bank’s Macro Financial Analysis Division.